We take a focused look at the swim in our continuing our analysis of trends in performance at the Ironman World Championships. With the introductory explanation of terms and graphics taken care of in our last installment, we’ll jump right in. Let’s cover the obvious things first: elite athletes haven’t made much improvement in the water since 1988. While the overall finish time has dropped more than two hours, swim splits haven’t dropped by more than about 7 minutes. In the men’s field the top ten athletes have managed to form a pretty tight pack, which indicates an improvement in overall consistency but also that exceptional performance in the opening leg confers relatively little advantage in the overall race. Exhibit A in support of this case is Andy Potts, the perennial shark on any Ironman start line. His approximate 4-8 minute gap on his pursuers rarely endures through the first half of the bike. That’s no ding against Potts. On the contrary, it opens a debatable point about self-fulfilling prophecies. Have no other athletes tried to improve their swimming because they believe it’s of relative value, resulting in a pack that’s content to cruise along in the wake of groupthink? No one is accusing the pros of sandbagging, but it does seem peculiar that there is so little improvement over the course of 30-plus years of competition, especially when we know there have been significant cuts in cycling and running times. Research has shown that professional triathletes have relatively poor technique compared to collegiate and Olympic swimmers. Speed in the water is overwhelmingly dependent on form rather than athleticism. Elite triathletes have the aerobic and muscular capacity of their swim-centric counterparts. They’re just comparatively sloppy. Outside of those athletes coming to the sport from a swimming background, no one seems interested in technique. To consider the athlete’s standpoint, it may be a case of adequate return on investment: better to sacrifice a few minutes in the water to Potts if the training time he spends in the water is better used to improve running or cycling performance. The men’s world champion has been the first to complete the swim in only six editions of the World Championships. Dave Scott did it twice. Even Faris Al Sultan’s blistering 49:54 during his 2005 win was only good enough for a third-best swim in the pro field. Of the two men in front of him, Tayama Hirokatsu finished 31st on the day and Simon Lessing DNF’d. The women’s champion has only won the swim three times. Perhaps the “50-to-60” rule has evolved thanks to three decades of cumulative wisdom. The podium is to be made elsewhere on the course. This offers another question for debate. The Ironman was originally conceived as a test to see if swimmers, cyclists or runners were the superior all-around athlete. Does the 2.4-mile swim distance offer swimmers like Potts a fair shake in their discipline, or do they get the short end of the long-course stick? Hillary Biscay was a collegiate swimmer before she turned into an Ironman pro, and her experience allowed her to exit the 6-mile swim in first place overall at the 2013 Ultraman World Championships. Increasing the distance closes the performance gap. Less obvious yet equally interesting is the fact that swim times made their most dramatic cut in the years immediately following 1985 and thereafter settled into the current malaise. Five of the top ten men clocked swim splits longer than an hour that year, when prize money was offered for the first time. The next year only one man took longer than an hour to exit the water. 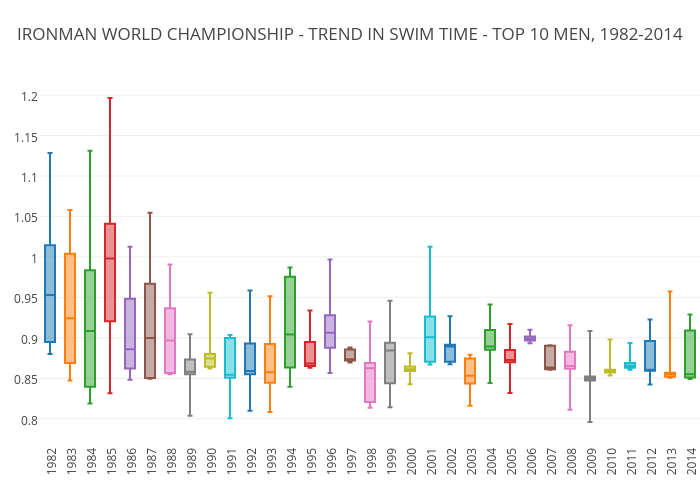 Two of the top ten men spent more than 60 minutes in the water in 1987. After that, no one exceeded the hour barrier again until 2001, and no top-10 man has since. 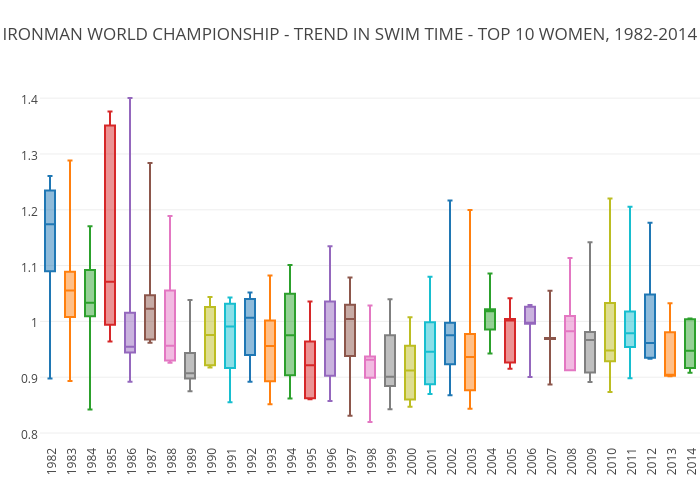 While top 10 women with swims exceeding an hour still exist, they are gradually becoming an endangered species. The general rule then is that if you want to get a winning performance in Kona then you have to deliver yourself to the bike in 60 minutes or less. However, that’s only the buy-in to get in on the game. Time-wise, the elite athletes come out of the water more or less on equal footing. Statistics indicate that the real aces get played during the other 138.2 miles. Conventional wisdom suggests that the spoils will go to an uber-biker or one who is fleet of foot. We’ll find out if those notions hold up to examination in future installments. Overall, it’s another small indicator that the prize money offer in 1985 was a significant catalyst for performance improvement. While the 60-minute mark has become the first bar to entering the top-ten, the sub-50-minute finisher cohort remains an exclusive club. Including Potts, there have only been 18 sub-50 swim splits clocked by ten elite finishers in Hawaiian Ironman history. They’re not all men, either. Wendy Ingraham owns two of those splits. If you enjoyed this analysis of Ironman statistics, check out Part 1 (overall performance). TRS Triathlon is a start-up website aspiring to lead the way in terms of journalism, opinion, satire and fun. Please tell your friends about us. If you are so inclined, learn how you can support TRS Triathlon. Follow Jim Gourley on twitter. Buy his books below. Kona 2015 Race Week Part 2 – Now With 100% More Beer Mile!